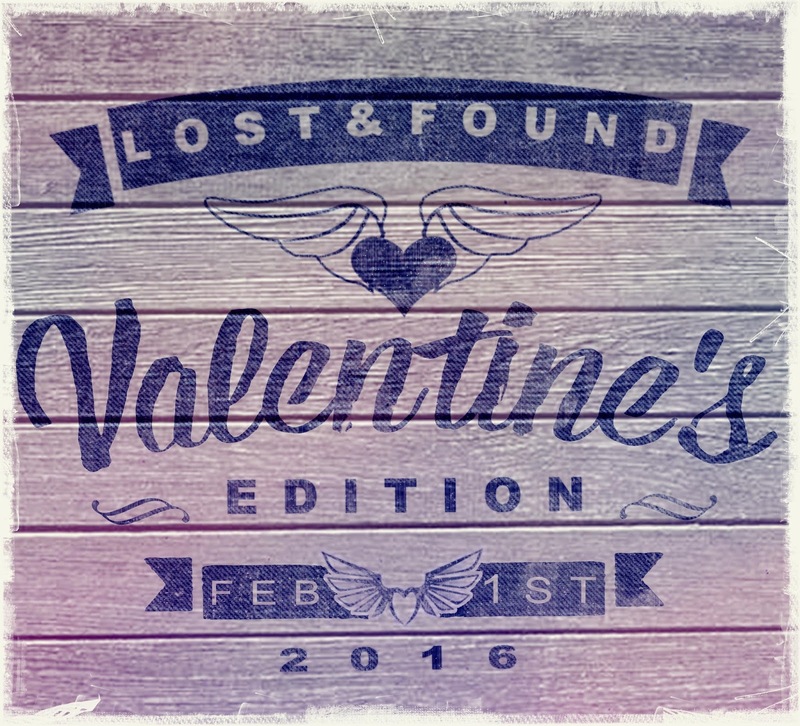 This post is my entry for the Lost & Found: Valentine's Edition blog hop hosted by Guilie Castillo-Oriard, Alex J Cavanaugh, Denise Covey, Yolanda Renee, Elizabeth Seckman, and me. Be sure to visit all of the hosts for this event. To find the full list of participants visit the list on Tossing It Out or any of the host sites. I'm combining my Lost & Found post with two other blogging events--The Question of the Month and Battle of the Bands. Let me answer this way: In all my years I've seen love come and go on several occasions. In some cases that love seemed more serious at the time than it really was--I guess I could say they were more like infatuations or love false alarms. A few were marriages and those were the most significant found and lost loves. I'd always thought that marriage was a forever kind of love, which in some abstract way it is, but the reality that I've experienced is that sometimes love gets a bit derailed along the marriage journey resulting in that train wreck called divorce. I'm no fan of divorce, but sometimes things break and no amount of effort can fix that which has been broken. I prefer love found, but love lost has had some upside in my life--especially when I consider what I've found after having lost a love. My Tossing It Out post for the Lost & Found blog hop is not a story. If you want to read one of my stories about this then check out my post at Wrote By Rote. Instead of a story, this post is about the impact that losing or finding love has had upon my own creativity. Love has inspired many a person throughout the ages. The ways that love has affected my creativity is probably similar to the ways it has affected some of you. For my Battle of the Bands song pick I'll offer a bit of evidence that I see in the lyrics of said song. On Wednesday my #IWSG post will deal with creativity with more specificity, but today I offer you a song with some lyrics that illustrate how love lost has affected me. Battle of the Bands is the blogging event hosted by Far Away Series and StMcC Presents Battle of the Bands. This event happens twice each month on the 1st and 15th. The premise is simple: Listen to the songs presented below and then in the comments vote for your favorite and tell us why you liked it. Then visit the links listed near the bottom of this post for more Battle action. This a song that I heard frequently on the Los Angeles Spanish rock station that I was listening to back in the 90's. I was immediately captivated by the beautiful melody and plaintive lyrical content. Despite my limited understanding of Spanish, I was able to grasp much of the sentiment of this song and I related to it. This has become one of my favorite songs of all time. In fact I'll make a bold claim that this is among the most beautiful pop songs ever written. Considering the hit status of the song in Europe and Latin American countries I think many might concur with my statement. Now here's a puzzling mystery about this song. It was written and first recorded by Italian artist Gianluca Grignani. However when it was played on the radio I understood the artist to be the popular Italian singer Eros Ramazzotti. In fact I liked "Mi Historia Entre Tus Dedos" so much that I went and bought every Ramazzotti album that I could find in hopes that my song would be included on one of them. To my disappointment the song was on none of those albums that I bought. In my recent research I cannot find the song on any Ramazzotti recording or any indication that he had ever recorded it. I might have said that I had misunderstood what I thought I heard on the Spanish language radio, but then I found more than one YouTube video attributing the recording to Ramazzotti. Somewhere a confusion developed not only with me, but with many others. I'm offering one of these recordings--although I'm pretty sure now that this is actually Grignani's recording--for you to listen to if you are interested in the version that enthralled me so much when I first heard it. Please don't vote on it! I think this is the best version out there so I feel like putting it up against any other version would be unfair. If you wish, take a listen to "Mi Historia Entre Tus Dedos". If you can solve the Eros Ramazzotti mystery I'd love to hear about it. the nights I gave you. you know as well as I.
I promise not to touch you — are you sure? just like me (or better, but I doubt it). Why do you look away this time? You ask me to stay friends. A friend I forgive, but you I love. They might seem banal, my natural instincts. To feel a little safer. remember that I’ve forgiven you, too. and leave, taking this story between your fingers. Look for an excuse and go. doing my best to hide my emotions. I've said these similar things in my partings with past loves. My times of loss have become times of great creativity when I'd write poetry and songs expressing my sentiments and desires. Maybe this was an action performed too late--my sad songs and poetry never resolved my break ups. Still I tried to fix the broken relationships with words such as those of this song. My guess is that the songwriter of "Mi Historia" went through one of those losses that inspired great creativity. There are many interesting recordings of this song to be found on YouTube (more evidence to why I consider this song to be so great). The recordings come in a wide variety of styles. I avoided the heavy thrash metal version (which I actually like especially because a violin is included in the instrumental line-up) but I thought it best to avoid that version. If you're curious check out Titanium for a rocking version of this song. 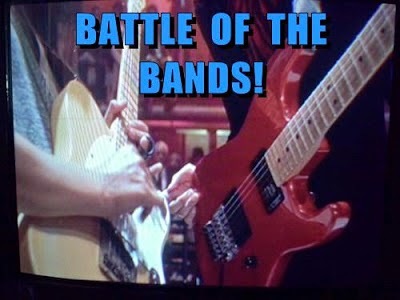 In this round my choices for the Battle are two live versions that are in similar performance settings, but quite different in their stylistic approaches. Dalma and Martín are both popular artists from Spain. Here is a jazzed up version of "Mi Historia Entre Tus Dedos". This is a reggaeton/cumbia group from Paraguay. They give the song an uptempo flavor that makes me want to get up and dance. Even if you don't understand what the artists are singing you can still judge whether you like the sound of a song or not. 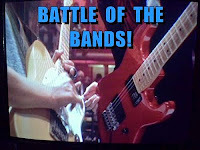 If you're visiting a Battle of the Band post for the first time then let me briefly explain. Please give each song version a fair listen to decide which one you prefer over the other. If you don't like either then at least tell us which recording was least innocuous to you. This comes down to your preference and it's as easy as that. Janie Junebug Righting & Editing. You've got a week to cast your vote, but try to do it soon so you don't forget! On Wednesday I'll be discussing the topic of creativity a bit more as I post for this month's edition of the Insecure Writer's Support Group. In that post I'll explain some of my thoughts on losing or finding love or any other circumstances that might cause our creative juices to flow. I could only listen to the second version of the songs you offered to vote on. The first one was forbidden because of the GEMA in Germany. So, I'm voting for the second one by the group out of Paraguay. I liked the fact that it was a little bit reggae but not totally. It has an easy rhythm that makes you want to get up and dance. As for the original version by Gianluca Grignani, I like it best of all. Too bad I couldn't vote for this version. You can find it on iTunes. I don't understand how people mix up Grignani and Ramazzotti, but I know they do. Maybe, it is because Ramazzotti is known throughout the world due to his music collaboration with singers such as Celine Dion, Tina Turner, and the late Luciano Pavarotti. I listen to lots of Italian music and find that the two of them have two totally unique voices. Grignani's voice is lighter and softer than Ramazzotti's, in my opinion. I agree the word Lost or Not having found provokes creativity. The creative spirit within us seeks to express what we have lost or what we are still searching for. Pat, wouldn't you know that the one country where that video was restricted is where my first voter is. Whoever did the version I heard first sounded exactly like Grignani so I'm sure it was him. Funny how so many people think the hit version was done by Ramazzotti. First vote goes to Los Verduleros--with an asterisk. Great song choice. I don't know if I've heard it before though. Teresa, I've only heard this song on Spanish radio, but I think someone should do an English version. I think you're right about the lost and found aspect of inspiration. Sometimes those losses make us stronger and lead to new things. My vote goes to the first one. Alex, surviving any bad thing strengthens most of us--or hardens us in some cases. I like the second version better, it gets my vote. Elsie, teaching and humbling, yes, loss and pain provide those. The writing is probably part of the healing process. Just thinking and running things eternally through our heads can't be good for us. There needs to be a release and often that comes through creating. I hear what you're saying about the "messy" when we get overly maudlin or bitter. All 3 versions have such different treatments. Amazing musicality in all of them. In the songs available for a vote, I choose #1--the "uptempo flavor" won me over. Enjoyed your post and listening to the music as I read. JQ, there were so many styles of this song on YouTube that it made choosing difficult. The jazzy version is fun, but I like the duet and the various instruments in the Dalma and Martin version. Plus, the duet fits the meaning of the song better. It seems appropriate to choose a song from a romantic language for this post. Spanish music is so heartfelt and lovely to listen to. The guitar is also beautiful. 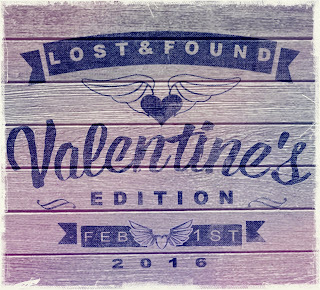 Thanks for sharing your thoughts on love lost and found and for hosting this hop. It is a good one for February. Mary, I don't even have to know what the lyrics are saying to enjoy Spanish language music, but that's even true in English for me. Oh, man... Lee, you've made this very, very difficult. I've listened to both three times, and can't make up my mind. I didn't think it'd be this hard... The original is still my favorite, but these two are great, GREAT covers. Guilie, intensity is a good way to describe the source of inspiration. The everyday stuff when we fall into routine doesn't often foster great creativity. I think this requires some training which might delineate decent writers from the real pros. Thanks for doing such a great job to make this blog hop a success. Oh Lee, that makes me so sad. I hate it when love fails. It can succeed. It can even be redeemed after almost any major issue. (My sister's marriage is an evidence of that.) It definitely takes incredible work, years of forgiveness, and a determination thicker than any I may possess. I understand why some marriage end. I just wish we could all be better people and keep that from happening. Crystal, a story is only sad until we reach the happy ending. But even sad endings have their place in life as well as the world of creativity. I think it's better when people try harder to make marriage work--especially when kids are involved. In our society divorce has become so easy. Los Verduleros gets my vote on this one. The emotions of love lost and found are the reason for great creativity! Yolanda, when we look at much of the body of literature and other creative genres we see so much having to do with the lost and found aspects of life. A vote for Los Verduleros. What a beautiful song, and thanks to Guilie for the translation! I too, was stuck on which version. In the end, I decided #1 had that sadness I heard in the original. My vote goes to Sergio Dalma & Vanesa Martín. Dixie, I'm glad you agree about the beauty of this song. Even done in the jaunty cumbia style the beauty of the melody comes through. A vote for Sergio Dalma and Vanesa Martin of course. Beautiful song choice! Few emotions invoke a more powerful flow of creativity than tears that drip from your heart through your fingers. My choice is Los Verduleros - I can't resist a good cumbia! Diedre, I like the way you rephrased the song title. And it's cumbia, my lord, in the morning! I love the term "Love False Alarm". I may have to steal that! Hugs to you and your loves lost and found! I like the 2nd video. Plus, the guy in the plaid shirt is kinda cute! Heather, especially when I was young I often had those false alarms that I was in love. They were short-lived, but I wonder where some of those could have gone if allowed to erupt into burning love. My wife said the same thing about that lead singer in the plaid shirt--he does exude some personality. I'll bet this band is fun in concert. Love the song. Great blogfest too. My votes for Sergio Dalma & Vanesa Martín. Mina, Thank you for visiting and for leaving your vote. 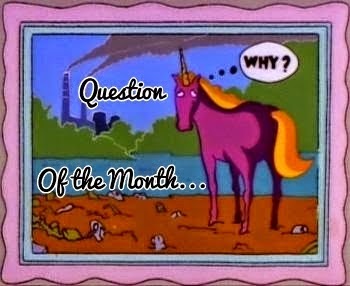 I'd like to ask you a question. Do you think more great poems and songs were written under the influence of lost love or found love? Your BOTB reminds me of the catchphrase of ABC's Wide World of Sports: "Spanning the globe to bring you the constant variety of sport... the thrill of victory... and the agony of defeat... the human drama of athletic competition..." By that I mean that you, more than any other BOTB participant I know, search the four corners of the earth to find music rarities to present in your battles. I agree with you that neither cover comes close to the Eros Ramazzotti version. The Dalma and Martín rendition sounded too much like the theme song from a telenovela. While I am not a big fan of reggae, I enjoyed the brassy, rousing, up tempo performance of contestant #2, the pride of Paraguay, Los Verduleros. They get my vote. Tom, to answer your question you will have to check out part 2 of this post coming on Wednesday. But to give you the short answer I'll say the greatest creativity stems from love lost or love unobtainable. I'll explain my reasoning in my #IWSG post. Appreciate the observation. Though I'd hardly say my picks have been rarities other than to most of us in the U.S. or who only listen to mainstream modern music. Like you I like to dig deep into the music that many of us never hear or have missed over the years. The guys from Paraguay are doing much better than I had expected. Hi Lee! As a Mexican I have totally heard that song more times than I can remember and I particularly like the Ramazzoti version since it's the one I've heard the most. But if I had to choose between the other two, I would have to go with los Verduleros. And you've got to lose a love hear and there before you find a new one I guess. Cely, I don't think there are many of us who haven't lost a love in our lives even if only in our minds. So are you saying that the version you remember is by Eros Ramazzotti? You are compounding the mystery. I want to find proof that he has this song on one of his albums and so far I've been unsuccessful. There must be an interesting music industry story to this. I vote for Los Verduleros though I didn't feel strongly for either. I've read that every story is actually a love story because all humans want love more than anything after their most basic needs of food and shelter are fulfilled. It makes sense that love, lost or found, inspires creativity. Susan GK, I think a case could easily be made that every story is related to love in some way. A lukewarm vote for Los Verduleros. Lee, I've never heard these songs but do appreciate exposure to new songs and such. I agree with Susan's comment above. My books are love stories. It's just that most people die in them. Stephen, death and love go hand in hand. I'm reminded how death is often a metaphor for love in certain poetry and literature. I'm not really a fan of this musical style and didn't much care for either, but I suppose I would say Los Verduleros is the better of the bunch. Give my vote to them. People always seem to think that love is magic and snaps right into place and you just live happily ever after, but love is constant hard work. You have to maintain it, and that means both parties working together. I don't ever want to go through a divorce, but if my wife just stopped trying, I don't know what other alternative there would be. You can't force someone to try. Beer, love does take a lot of work and determination to make it a success. I tried to force my relationships that ended in divorce. If that ever happened again (I certainly hope not) I would be less likely to put a lot of effort into the restoration as I think it shows a certain weakness. How can you not like these musical styles? You need to start listening to more Latin music to get acclimated to it. Loss does tend to fuel creativity. Andrew, I agree and will expound upon my view on Wednesday. Sometimes we find more by loosing, makes sense to me...meeting the worng people at the right time or the right people at the wrong time, always has a takeaway, a positive one I'd like to believe..my vote goes to the first one..
Nabanita, I'd rather avoid loss and pain, but there are times when it is unavoidable. Excellent post Lee. My choice is Sergio Delma. Yvonne, I think the lyrics to this song are nicely done--they seem so real. A vote for Sergio Dalma. Lee, I'd say most lyrics are spun from the artist's experiences and like you the word scribbled on paper didn't resolve the circumstances facing that individual, but the process lifted the spirit or healed the heart. The original is beautiful. I see why you like it so much. I'm giving my vote to Sergio Dalma & Vanesa Martín. I love the jazzy sax intro and the whole cover mellowed my heart more than the second rendition. Great song choice! Cathy, the most heartfelt and impacting songs are probably drawn from true experience. And you're right--this type of writing probably does more for the writer than the one to who it is written. YIKES! There is a lot of information here. Guess that's bound to happen when all of the things collide in the blogging world. I would have to agree with your assessment that finding or losing love can be a great catalyst to our writing, but I generally need to use that and make it less personal. I suppose that's how I sooth myself to get through the trauma easier. As for your BOTB, I'm gonna go with Door Number 1, the Jazzier version. Wait a minute while I scroll up and get the names of the performers. Ah, there it is...Sergio Dalma and Vanessa Martin. I'll try to make it over to Wrote by Rote and see what your wrote, but this is gonna be a busy week; what with these two hops and the fact that I'm committing to get back into posting for the IWSG. Yikes indeed! FAE, I tried to keep this post as short as I could but I guess I had too much to say. Writing is some of the best therapy I can think of and there is not necessarily a right or wrong way to do it. I like the Sergio and Vanesa version the best. They perform well together and I love the music. As for the first song, a Shazam scan reveals it to be Grignani, as you say. This isn't the first time a person has confused one artist with another. There are a lot of humorous songs attributed to Weird Al Yankovic, even though he's had nothing to do with the song. it's possible, even the radio station DJ you heard from so many years back, confused the singer of the song. If only you had Shazam back then, then this wouldn't likely be such a conundrum. Jeffrey, never heard of this Shazam site--very cool. I'll have to refer to this in the future. I'm still puzzled how the radio station would be misinformed, but it probably had more to do with my understanding of what I heard. Jeffrey, the website seems pretty helpful, but I can think of many times when that app would have been very useful to me. If I start understanding phone apps maybe I'll try that. Right now I'm still trying to figure out the basics of my phone--like how to answer it. I've also found breakups to be great for creative writing. Writing is so cathartic and really helps one to work through their feelings. I'll go check out your piece on Wrote by Rote. Re: your battle: what a beautiful song! I loved the version by Sergio Dalma and Vanessa Martin so please give my vote to them. In fact, I like their version better than Grignani's version. Beautiful sound. It was nice reading the translated lyrics. Thanks for including those. Nice of Guilie to translate for you. Thanks for the Love Lost & Found Blogfest! Michele, so right about the cathartic effect of writing. Now if I can channel this better into my writing when I'm not depressed. The discussion between Guilie and I about providing me the translation of this song is what brought about the Lost & Found blog event. I'm glad we decided to do it as I've been reading some interesting takes on the topic. A love false alarm. I love that! It's better than my explanation that you don't really know what love is until you know what love is. Yeah, mine needs work. Elizabeth, I can go with not knowing what love is until we know what love is. Then again do we ever really know? Thanks for helping out with what has turned into a very successful event. Some pretty neat posts that I've read so far. I liked them both for different reasons. Though, the duet and more "serious sound" of the first ultimately won me over because nothing that upbeat (like the second version) should have those lyrics. Another vote for Sergio Dalma & Vanesa Martín! Jennifer, I'd tend to agree with your reasoning on this. "Another vote for Sergio Dalma" to quote you. I really like this battle, Lee. It's tough! I've listened to both once. I'm now about halfway through each of them, doing that stop/start thing by way of comparison. I'm still feeling stuck. I like them both. As much as like the second one, I'm going to vote for the first. It's going down that road that makes the song haunting (versus the very fun upbeat version #2). Put me down for Dalma and Martin. Robin, I totally get what you're saying! First off, thanks for coming up with the idea for this bloghop. It's been fun to see how differently each person executes it. You're right about how the pain of lost love, or loss, in general, can spur a burst of creativity. (Once one gets past the period of numbness, that is.) The biggest challenge is to avoid stifling the creativity with melodramatic self-indulgence, if you know what I mean. To avoid being drama queens... or kings. As for the BOTB, I never heard that song before, but its sound and lyrics are beautiful. I'd have to vote for the smoother, jazzier Dalma & Martin rendition. Like Robin said so well already, it has a haunting sound to it, more in keeping with the lyrics. Susan FS, I've also been enjoying the variety of posts for this blog hop. Interesting to see what ideas the love prompt evokes. I agree that the creative outlet can be a good thing, but can certainly be to focused on self. Okay, first I'd like to know who's gonna pay for my carpal for all the scrolling I just hadda do! (Arlee's best reply- your mouse has a scroll button, bozo! )Second, I am glad you printed the English lyrics- I understand them, and I don't mean the language thing. For me, it was no real contest. Dalma and Martin. CW, yeah that was long, but I didn't know how else to do it. At least I'm saving part of it for my Wednesday #IWSG post. The lyrics are beautiful. They remind me how people in Italy often say, "We had a great story," when referring to a romance. I never did find out why "story" and "love affair" seem interchangeable in Italy, though. Tui, glad you've joined in--the entries have been interesting so far. Love stories seem to be among the most popular in all mediums of expression. It's the fundamental of life and relationships I guess. Sergio Dalma & Vanesa Martín remind me a bit of Dave Matthews Band (whom I love) so I'm gonna vote for them. I love Spanish love songs, too...they always sound so passionate! Megan, the comparison to Dave Matthews is one I hadn't thought of, but now that you mention it I kind of hear that. I like Dave Matthews too. John, I would agree with your assessment. They say loss makes us stronger, and I think it does, though sometimes I think it wants to kill us first. Finding it again can bring us back from the dead though. Does that make us zombies? HR, I've sometimes felt like a zombie when I was going through the suffering of loss. The pain can be so devastating. Being able to love and move past loss is one of the best things we can do both for ourselves and others. Refusing to let go or move on can sometimes have worse consequences than any weapon or illness. Sheena-kay, not moving on would be such a disaster though I know some people who are like this. They remain at a standstill in their lives waiting for magic that will never happen. We have to keep moving forward because life is short and can rapidly leave us behind, alone and despairing. Damyanti, both versions are very good in their own special ways. Birgit, I don't wish that kind of creativity on anyone, but some people might like the drama. What you've said about marriage is so profound - that you always thought marriage was a forever kind of love - which it is - but in an abstract kind of way. I think I paraphrased. Marriage is forever, if both of you can make it that way. If not, then it's even sadder than other love stories that end. Hopping over from the Love Lost and Found Blog hop. Pleased to meet you. Kalpanaa, even though a couple of marriages are behind be and the burning love has cooled off there is still the memory that can't be erased of a love that was and was very good for a while. My love didn't really change, but the person did. Losing love is about losing part of oneself. Not too good to experience. My vote is for Sergio Dalma's. Jazzed up but still very much sentimental. The lady singer gave it life. Thanks for hosting Arlee! Hank, your observation is very true. I don't like losing part of myself, but I suppose in the loss another side of myself is found. I liked the duo; it fit the nostalgic quality of the lyrics better. They just sounded better too. Break ups are hard, but don't always have to be ugly affairs. I've been divorced 3 times, and it was a mutual agreement to part. I don't do well with relationship endings, perhaps that is why I have a hard time ending jobs, group commitments, and stories, of course. Thanks for hosting the bloghop Lee. Dolorah, I'm an in it for the long run kind of guy, but it takes two to make a relationship work. When one wants out there's not much the other can do. Love does seem to spike creativity, though love lost/unrequited probably generates more song/poetry/stories than love found. My vote goes to the first version, that's just beautiful! Here from the L&F, thank you for hosting. Nilanjana, someone should do a study about creativity and the output that has resulted from loss as opposed to finding love. Love keeps life interesting to say the least. It is the passion it brings to life that helps creativity. And yes, it can also hurt creativity. Thanks for the translation of the lyrics. They are truly beautiful. I agree with Nilanjana. I like the first version. Victoria, "love makes the world go round" as has been said and I think it's true. Creativity thrives when things go wrong. The tougher the times, the more creativity grows. Obstacles birth new ways of thinking and doing things...resulting in new ideas. I love my jazz, so I vote for the duet. Michelle, you have encapsulated the concept very well. Losing love can be devastating, but there's also a lot of opportunity for growth in those painful situations. As for the music, my vote goes to Sergio Dalma. Thanks for sharing! LG, if we don't grow through adversity then we're in trouble. It's important to move forward and to do it positively. Love found is much better than love lost. But losing love and having a broken heart can sure inspire stories, poems and songs. My vote goes to Los Verduleros! Chrys, I'd much rather deal with love found and love kept. Don't like the pain of losing love. Michael, the events all meshed together well. Thank you for coinciding yours with ours. I'm not a very creative person when I'm sad, but I suppose for many others, if not for love lost we wouldn't have some of the songs we do. Patricia, I suppose we all react to life in different ways. I'm not a fan of either version, really. But I like reggae, so I'll vote for Los V. - "reggaeton," whatever the heck that is. Since I don't speak Spanish, the lost love aspect of the lyrics is lost on me. SBB6, a matter of taste as the game is played I guess. I've had moments of hope and longing for love that inspired some poetry in the past. I think moments of sadness or brokenness have a lot of influence on our creativity. Elizabeth, I'm about to start composing my post for #IWSG now and this is part of my topic. Mike, your choice gets you to moving if not on your feet dancing. Divorce is such a sad thing, really. No one gets married with the idea of getting a divorce later. Misha, divorce really is a tragedy especially when a couple has children. I think there is some merit in working on a relationship for the sake of the children and family, but sadly many couples are so self-absorbed and immature that they the adults come first. Things can be worked out if people try. Man, no fun to lose--at least not usually. That version of the song you first heard and fell for, I liked it immediately - right from the sound of the first few notes. The lyrics as translated into English don't appeal much to me. They're too straightforward - not really poetic or creative, but kind of like a trite, choppy short story. Maybe they're more poetic and creative in the original language. But listening to the song before understanding the lyrics, and just taking it in musically, and accepting the words as merely "complementary sounds", I really enjoyed it. If I'd heard it repeatedly on the radio, it's not hard to imagine that I too would begin looking into what it was titled and who recorded it. As for the Battle... Well, this was really easy. Although Sergio & Vanesa were nowhere near as good as the original, they blow Los Verduleros away! Vanesa looks, to me, a bit like Linda Ronstadt. (Yes... I would!) Her singing is OK, and so is Sergio's. How in the world Los Verduleros got it into their heads to perform THOSE lyrics in THAT style is way beyond me. Make no mistake - I really DIG their style. Great, upbeat music, but it's NOT for those words. Had you NOT posted the original, and had you NOT posted the lyrics (so I would have no idea what the song was really about), I would have voted for Los Verduleros. But knowing the actual sentiment of the song (even if I think the English translation is kind of ho-hum, been there / done that) there is no way I can accept that "CELEBRATORY" vibe by Los Verduleros. What... were... they... thinking? Sheesh! It was like they thought "Maybe I’ve begun to feel alone..." was really saying "It's fun to stay at the YMCA!" WTH?! STMcC, I guess the typical style of Los Verduleros guided their interpretation of the song, but my first reaction was the same as yours. But then as I listened more it did start to grow on me and I could imagine a circumstance where the feelings expressed in the lyrics might be presented that way. Different people respond to romantic situations in different ways I guess. I liked the way the lyrics are presented. I can hear myself having said similar things when I was grasping for straws in the dwindling haystack of a relationship. And it seems like a short little drama that I'm watching unfold through these choppy words. I can recall after the break-up between me and my first wife writing a song (and probably more than one) that expressed this similar idea. At the end of a relationship many folks like me will get to that say anything state of thinking trying to save what is doomed. Now that you mention it, Vanesa does have that Linda look--kind of. Anyway, another vote for Sergio Dalma. While the first is really nice sounding for whatever reason I'm more into Los Verduleros. Madilyn, marriage can have an upside. Gotta find the right partner. But being single has its advantages as well. Sergio and Venesa has my vote. The original holds the crown, true. But S & G sing this as a love song. Los Verduleros for me. I just loved their happy, upbeat-yet-still-laid-back beachy vibe! It's Los Verduleros with another vote. Beautiful blog bit today, Lee. The Lost and Found is a great topic. As you indicate, it inspires people to be creative in the midst of their joy or pain. I love a good heart breaker song or a book that draws you in to the plight of the characters. Intensity! As for my battle pick: Sergio and Vanessa, all the way! Cherdo, heartbreak is at the core of so many of our life experiences. Looks like your blog was recently hit with a spammer. That happened to me a few years back. But then I found a spell caster who helped me out. LOL JUST KIDDING!!!!! Jeffrey, Spam comments usually don't last long on my sites as I monitor them pretty carefully. I wish someone would cast a spell on all spammers to get rid of them.